HORTOCLIP tomato ring or clip for tutoring your vegetable plants. 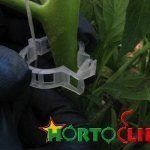 HORTOCLIPS: the trellising clip (tomato ring) to tutor your tomatoes and cucumbers. 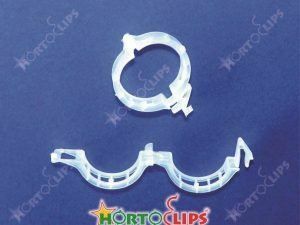 The tomato ring HORTOCLIPS allows you to make much quicker progress with your tutoring chores. Here you can see how the HORTOCLIP tomato clip or tomato ring is quickly fitted in conjunction with the HORTOMALLAS trellis netting, improving the yields of your crop even more. 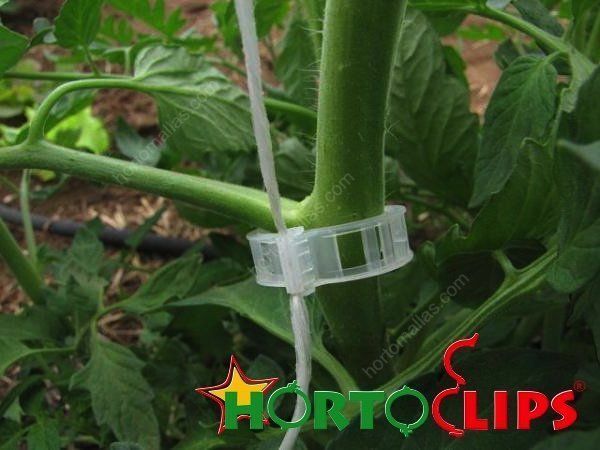 HORTOCLIP tomato ring is attached to the main support system on tutor netting or agricultural raffia. 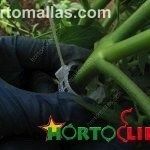 The specific or general vegetable or tomatoe clips are widely used in both raffia tutoring systems as well as when using HORTOMALLAS horticulture support netting. 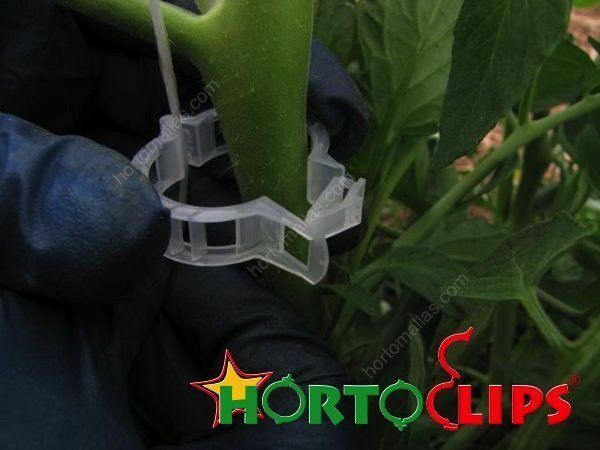 As the plant grows, a HORTOCLIP tomato ring is attached to the main support system (whether that is tutor netting or agricultural raffia) tying the stalk of the plant (which could be for tomatoes, cucumbers, peppers, melons, eggplant/aubergine or chillies) acting as an “artificial tendril” supplementing the plants´ own support system. This might be passively as in the case of Solanaceae, where the stems are fed directly through the HORTOMALLAS squares with or without a clip, or actively as with Cucurbitaceae where the tendrils search for a support point. HORTICLIPS are support rings designed to support any kind of vegetable cultivation, and work equally well in raffia support systems as well as plant tutoring using horticulture support netting. Using tomato rings or HORTOCLIPS clips reduces the strain that the plants are subjected to when manually feeding the stems through the tutor netting squares (this can be reduced by using a double wall netting system) or when winding raffia around the vertical stems. HORTOCLIP tomato rings can be reused for multiple cultivation cycles and work just as good in open fields as they do inside greenhouses. HORTOCLIPS have a working diameter of 23mm, allowing them to be used as cucumber clips in greenhouses, where the tendrils are not plentiful enough to support the weight and length of this hybrid Cucurbitaceous plant with raffia . Placement of HORTOCLIPS in tomato plants as an aid to the support system. 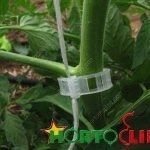 In this photo, you can see how simple it is to fix the HORTOCLIPS tutoring rings, to support the growth of tomato plants for example. 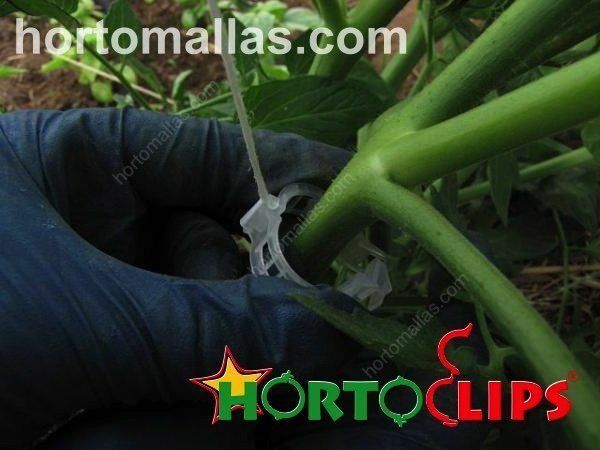 It should be remembered that using HORTOMALLAS support netting reduces the need for tomato clips (whether that be for tomatoes, cucumbers, peppers or melon) because the net itself acts as a support for the plant. The freedom that the plant has to grow improves its development- manual handling of plants reduces the yield per hectare by 8 to 10% due to the strain it puts on the plants. Additionally, the reduced need for labor in turns reduces the manual transmission of plant pathogens. Using HORTOCLIPS tutoring rings hugely streamlines the work of accommodating the plants within the plant support system, whether you are using a horticultural support net like HORTOMALLAS, raffia or just attaching them with stakes as seen here with these tomato plants. Tomato ring HORTOCLIPS placed in tomato as support for the support of the crop. 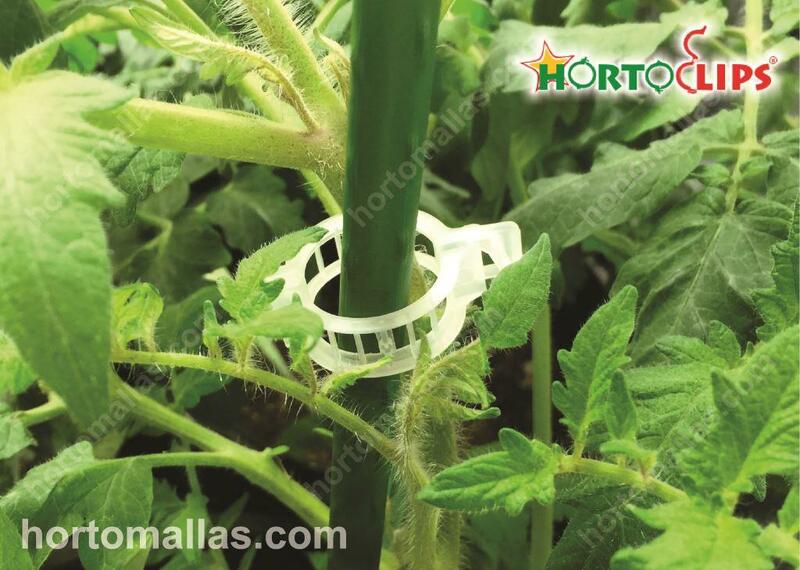 The HORTOCLIPS tomato ring allows airflow and prevents moisture from accumulating along the surface of the ring and stalks, thus avoiding the growth of fungal diseases.